Description: 1 Click Sweep brings to you 10 + utilities that work together or separate so that no important traces are left after using the World Wide Web or your PC and other service that involves private data, identification and secure transfers of information. This is the application specially designed for all your privacy requirements. It can be used to safely wipe useless files or even clean traces of junk disk space and user activity. Description: 10Cleaner Free is an easy but powerful tool for cleaning your Windows PC, allowing it to optimize its performance. 10Cleaner Free removes unused files from your system with it allowing Windows to run faster and freeing up valuable hard disk space. 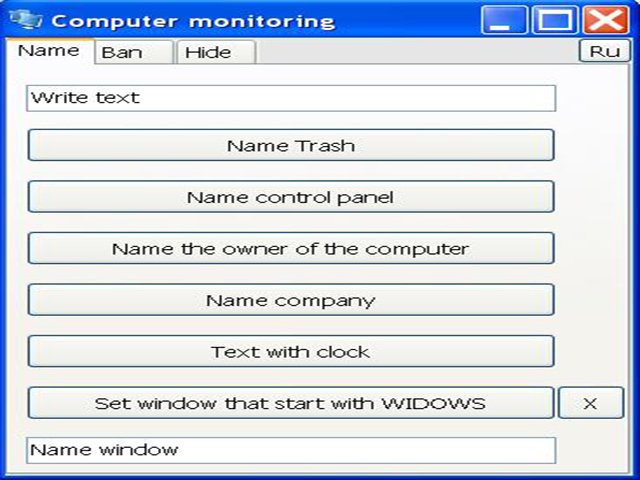 Description: This Program can: 1) Rename the Recycle Bin and the Control Panel. 2) Change the owner's name and organization name entered when installing Windows. 3) Add custom text next to the clock. 4) Create a window that will open before the user's selection. 5) Block: Shut down the computer, change the desktop, start the registry, auto-run CDs and launch Task Manager. 6) Hide: The control panel, search, and desktop icons. Description: 4Diskclean finds and fixes PC problems fast, keeping your system running at peak performance and reliability, and properly maintains Windows to prevent problems altogether. This awarded software will :Speed up your PC ! Clean up and fix it. Modules : Registry cleaner - Block Spyware - Disk Cleaner - Protect your Privacy - Delete Duplicates - Disk Stats and Graphics - File shredder and much more. Description: 7Fixer Toolkit is a simple and useful utility which is designed to help you to repair broken videos on your PC. 7Fixer Toolkit is free, but it only supports the Audio Video Interleave format. Description: 7Optimizer Utility is a simple-to-use program that is designed to speed up your PC and fix registry errors. 7Optimizer Utility plays an important role in cleaning and fixing registry errors. 7Optimizer Utility is a straight forward application to safely clean, repair and optimizes your PC. Description: A fun and free Really Small App showing Running Tasks, Current Startups, CPU & Memory utilization graphs, and the number of connections to your PC from remote computers (anything greater than zero could be due to Trojan viruses or spyware). Can be minimized to the System Tray where it also enables you to change your default printer directly from the System Tray or you can have an unobtrusive monitoring window showing at all times. Description: The standard Add/Remove program can't uninstall applications completely which offen leaves broken registry keys ,unnecessary files on the hard disk.The more junk files your computer have ,the slower it runs. Absolute Uninstaller can wipe off all the junk files clearly in seconds.It offers a more user-friendly way to remove unneeded applications and to improve your computer efficiency.